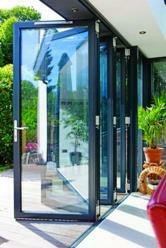 A bi-folding door is a type of door which opens by folding back on itself in sections. Folding doors are similar to French doors but they are able to open up a space further and can easily open up to 7 metres or more. These doors are designed to provide quick and easy space division and give a contemporary way of allowing you to have open plan living indoors, while external bi-folding doors give you unobstructed views of the outdoors, so it really feels like you are bringing the outdoors inside. They have a pleasing visual appearance and come in a wide range of colours and styles. 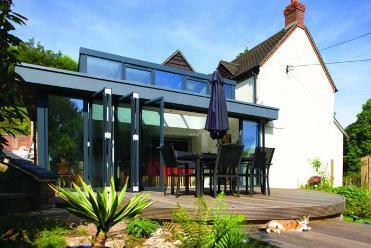 Here at Markwell, we specialise in all types of windows, doors and conservatories. We are based in Bishops Stortford and have a large variety of products to choice from. With us you will always have a great choice of the type of style that will most suit your home and your budget. Boundary removal: This product breaks the barrier between one living area and another. You can easily bring your garden into your living room by opening up your existing doors or walls. The view will be incredible and you will be able to enjoy both spaces of your home at any time of year. They combine art and function: These types of doors work well as insulators and can conserve the heat in any room. Frames and panels are sealed between the edges to prevent wetness from entering the room. They can insulate your home effectively, reducing heat loss through the glass. Make the area look larger: If you choose to install these in your home or even your office, you can make the area look larger than it actually is. Since these doors allow natural light in, they are the best way to brighten up any area in your home. Here are a few points you need to take into account when buying the product, because this is very important if you want to make your home look stylish. The style should match existing furniture and fittings in your home, so make sure you have the right style for you. 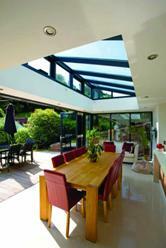 Markwell Windows and Conservatories are based in Hertfordshire, near the Essex border. We offer a large range of doors to complement any buildings style and we will happily find a design that suits your home and living space the best. Our products are thermally efficient, low maintenance with multi-point locking systems and come in a range of finishes. Why not come take a look through our products at our Bishops Stortford showroom to find the one right for you.